Freelancer vs. Entrepreneur: Which one are you? In another post I interviewed a woman who makes over six figures part time and from home baking cakes and running a baking blog. I shared her story with you as a lead-up to this post. Her story in summary: She is both a freelancer and an entrepreneur. Freelancing vs. Entrepreneurship is the topic of discussion in this post. Let’s talk about freelancing first. ​Freelancing is an exchange of time for money. For example, a proofreader exchanges her time (the time she spends proofreading) for a sum of money (paid to her by the client who needs their material proofread). Simple; right? But have you considered the implications of this exchange? The pros and the cons? First point: Time is limited and so money will be limited, too. A proofreader can only proofread for so many hours in a day, so there will always be a limit to how much she can earn. Consider this in light of your work-from-home goals. Are you satisfied earning a capped income? If you’re just looking to earn some extra money on the side (a.k.a a side hustle), freelancing is perfect for you. You take on the work you have time for and that’s your supplemental income. If you’re looking to replace your income entirely and work full time from home, is a capped income okay with you? Some would say it depends on the cap. That’s exactly why I always ask my interviewees to tell me how much they make and how many hours they work and what their expenses are. They are invasive questions, but if the interview is to be of any use to you,​ it has to be a bit invasive. Next point: You are your own boss, but at the same time, you are an employee. Your income comes from your clients. You have to keep them happy! This means you have to mind your email quite a bit. Sometimes it feels like you’re “on call.” All of this creates an employee-type feel. Are you okay with this? Last point: You’ll make money fast…but not necessarily a lot of it. The exchange of time for money means that when you’ve given your time, you’ll be paid for it, and in some instances you’ll be paid BEFORE you spend your time! No matter how new and small your freelancing business is, that first client you get will mean money is going to come in. The tough part is usually at the beginning when you’re hustling to find those first clients. As you build your reputation, clients will come in more easily. QUIZ TIME: Rose has a cake-baking business she runs from her kitchen and a blog she runs from her laptop. Which business is freelancing? Cake-baking. She spends her time baking a cake and she gets paid for it. Rose’s cake-baking freelancing business is a work-from-home business, but it isn’t an online one. Online freelancing is an online exchange of time for money. Take proofreading vs baking cakes. I get a transcript via email from a court reporter I only talk to via email. I proofread it on my iPad and then email it back. I email her an invoice and she pays me through PayPal. Online freelancing is my specialty. I prefer it to physical freelancing because it’s much more convenient and it has very little overhead. What is the difference between online freelancing and entrepreneurship? First let’s get clear on what entrepreneurship is. Simply put, entrepreneurship is the creation of a business. But the big difference between freelancing and entrepreneurship is that with entrepreneurship, you are not making a direct exchange of time for money. You dedicate time and money creating something with the belief that it will generate money sometime in the future. 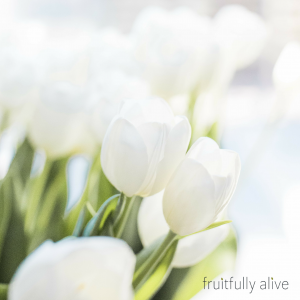 I started Fruitfully Alive with the money I made proofreading. I paid for the design of the site, the logo, the graphics. I spent time writing and researching posts, embedding forms, setting up social media accounts. I didn’t make any money at first. Now I do. And the money coming in is not necessarily directly related to the time I put in like it is in freelancing. First point: You will invest a lot of time, money, and energy before seeing returns. Are you okay with that? Do you have those kinds of resources to spare? Second point: There is no capped income. One of my mentors started her blog as a part-time hustle and was making about $200 a month. 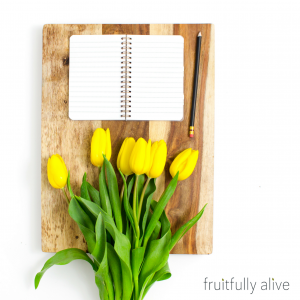 She continued to learn through courses and implement new things and she grew her blog. She never increased her work hours. About a year and a half ago, she was earning $20,000 a month. Today she earns over $100,000 a month. And she continues to only work part time. That’s not to say that all bloggers make this kind of money. Not even close. It’s the appeal of a business with no income ceiling which draws many to online entrepreneurship. You can also grow your business to a comfortable, say, $7,000/month and hold steady there. It’s up to you. As an entrepreneur, it’s all on you. You are not dependent on clients, you are dependent on you. Having clients creates a pressure to work. There are deadlines to be met if I want to get paid. Now, as an online entrepreneur, there is absolutely no one pressuring you to work. You have to keep yourself motivated. It’s up to you to make it happen. Consider all of this in light of your work-from-home goals. Do you want to be an online freelancer, or do you want to be an online entrepreneur? Which path should you choose? Why did I decide to freelance first? Hopefully, this post has helped you consider the factors that go with each path. I have no regrets about the order of paths that I chose because they followed naturally from the steps I took before them and from what my life was like at the time. As you know, I started a part-time online freelancing business proofreading transcripts for court reporters when I lived in Los Angeles. I was looking to break into the entertainment industry but needed a way to earn money while I did so. I saw all of my friends waiting tables. It didn’t pay much, so they had to do it full time. But then that meant they couldn’t put a lot of energy and time into what they really wanted! Online freelancing was perfect for me. I was able to earn a full-time income on part-time hours which left me free to pursue my dream career. The big surprise was when I discovered I had a passion for entrepreneurship. So it’s not that I fell in love with proofreading. I fell in love with being my own boss. Since I was suddenly realizing that self-employment was my true calling, I knew the capped income I could make proofreading was not enough for the standard of living I wanted to have. So that’s when I turned my eye from online freelancing to online entrepreneurship and Fruitfully Alive was born. It is a still-evolving venture, but I am very happy with the path I’ve carved for myself. Should you start as an online freelancer when you know what you really want is to be an online entrepreneur? Freelancing is the simpler, faster step so I understand your thought process easily. It is not a bad plan. Is it the optimal plan? It depends on your reasons. Whatever the reasons, really think them through. You can always shoot me an email and we’ll talk. But if you know with certainty that you want to be an online entrepreneur, but you have decided to start as a freelancer first, then I would suggest you choose a freelancing niche that complements your entrepreneurship aspiration. For example: If you know you want to be a blogger, but you’ve decided to freelance first, choose virtual assistance as your freelancing path. Your clients will be bloggers, and that’ll give you an insider’s look into the world of that business. You will learn to do things that will be relevant to you when you decide to start your blog. 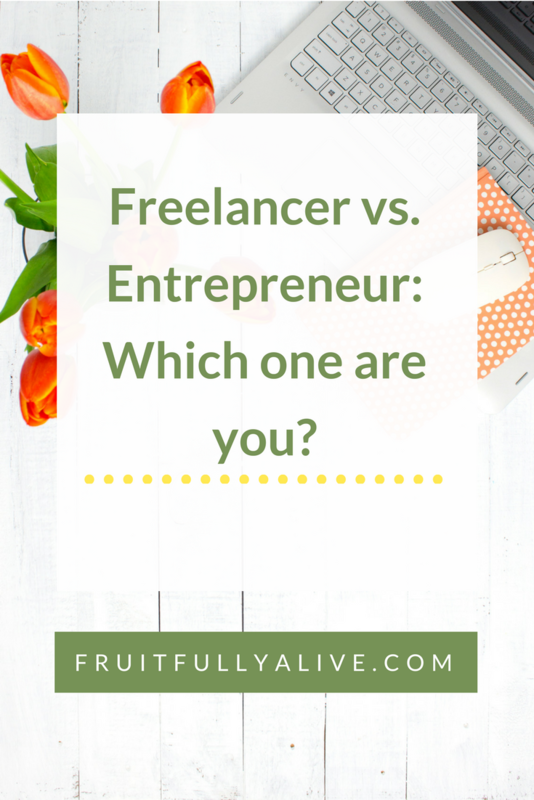 Can you be both an online freelancer and an online entrepreneur at the same time? Yes! 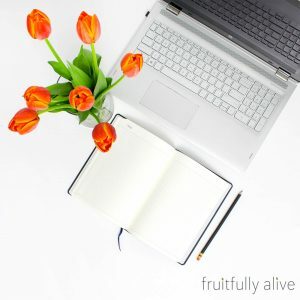 In my case, Fruitfully Alive makes me an online entrepreneur, but I also coach some of my readers 1:1 which makes me an online freelancer, too. This is also an example of doing both to complement each other. The difference is you have to establish yourself as an online entrepreneur before being able to do this kind of freelancing. Whew! It’s a lot to take in! What do you think? What path(s) are you considering? Hi. I want to start a business but like most people I am at a stalemate. By day I work in Investment Banking; which pays peanuts, if you can actually believe that. The reason, I live in Pakistan where economic conditions have squeezed the young generation and lack of creativity hinders the spirit of being your own boss. I am hoping for some guidance. Your blog actually made alot of sense. But can I actually pull it off is a question of significance. Hi Mahwish. One of the reasons I love online business is that you are not limited by your location. You need a good Internet connection and determination. If you want to start a business, start one. You can do it! Awesome! This is one of the best inspiration for freelancer. Very informative and nice guidelines.